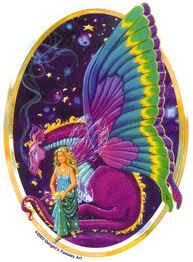 Powerful beings of the astral realm, dragons occupy a soft spot in my heart. I don’t regard them as fearsome creatures spewing fire and wreaking havoc as they are often portrayed doing in popular fiction. They are quite powerful and are capable of destruction if they feel it necessary, but there is so much more to dragons than most people know. Call me odd, but each night I visualize a huge dragon perched atop my house, guarding my property and all the inhabitants sleeping there (or prowling around, in the case of the cats). Yes, I call in angels and guides and Spirit as well, but there is something very comforting about that mellow dragon stationed confidently on the roof. That particular dragon is a golden color and seems very grounded: a house guardian dragon. Once when a friend needed protection from some people who were tormenting her, a blue dragon appeared as I asked for help. I know, the fiercer protection dragons are red or even black (chaos), but this one was blue. I think it would take a lot for me to call in one of the fierce kind. All I wanted was for the trouble makers to leave my friend alone. I was willing to be quite peaceful about the whole thing, as long as they left. My friend reported afterwards that her tormenters immediately left her alone and she didn’t even see them for a very long time afterward. When she did see them, they had changed their whole attitude, and even regarded her with a certain amount of respect. That blue dragon occasionally comes back for a visit just to say hello. Being a practitioner who works with angels, I hate it that Archangel Michael is often depicted slaying a dragon. The poor dragon has been demonized over the ages in western society to represent evil. Far from being evil, dragons can be wonderful guardians who will protect fearlessly when treated with respect and generosity. They can also be playful and even teasing, and will teach you valuable lessons by showing you how to laugh at yourself. In my bedroom I have a sitting area with my modest, yet ever growing, collection of dragons in the form of figurines and stuffed animals. One way to coax dragons to hang out with you is to collect dragon items. They view such collections as a welcome mat stating they will be accepted in the household. I also have a large, stuffed, blue (of course!) chinese dragon on my bed. What better place to have a guardian dragon than in a place where you spend 1/3 of your life? Even the name of this website – MoonDragon – refers to the cyclic feminine creative forces of the Moon controlling a woman’s “Dragontime” (referring to her menses) and her powers of procreation, literally by having her children and also creatively, in thought, ideas, and her deeds. Since I have gone through menopause and have reached the crone phase of my human life, I am now holding all my dragon-energy within me as I also hold onto my blood. This phase of a woman’s life is a very powerful time for women and has been honored as a very spiritual phase of our lives. We become elders in our community and teachers of younger women and girls. I like that, especially since I, too, am well into my cronehood! If you would like to read more about dragons and how to call upon them in magick you might like to read Dancing With Dragons by DJ Conway. If you have other sites, books, or dragon knowledge to share, please feel free to do so. I’d always want to be update on new blog posts on this internet site , saved to favorites ! . We’re a group of volunteers and opening a brand new scheme in our community. Your web site provided us with useful information to work on. You’ve done a formidable job and our whole neighborhood will probably be thankful to you.